Say it ain't so Conor! Is the UFC's hottest prospect fabricating followers on Twitter? Conor McGregor has quickly become one of the most popular and polarizing figures in the entire sport of mixed martial arts after his meteoric rise into the UFC ranks earlier this year. It’s no surprise given how much attention McGregor has received since signing with the UFC that he’s closing in on 80,000 Twitter followers and his exchanges with fighters like Diego Sanchez have become one of the most interesting battles to watch on the social networking site. British fighter Luke Barnatt isn’t buying McGregor’s popularity, at least via Twitter that is, because he recently did an interview with The MMA Hour where he accused the Irish fighter’s management team of scamming fans into believing he had more followers than he actually does in real life. @LukeBarnatt Hey, Frankenstein, this is the fight game. I'm after the GOLD. ONLY. You're a TUF reject. Crying for attention. Harsh but true. "Paradigm is the management company that I believe that Conor McGregor is under," Barnatt told the show. "They have this interesting concept that they believe that your following is depicted by how many people you have on Twitter, so your whole MMA following, if you’ve got followers on Twitter, then obviously you’re a big deal, and they find that easier to go out and get sponsorships and make you look important. So they employ this thing called Tweetbot. You pay a certain amount of money, and you get these fake followers. So they’re built and they’re made by a computer, and they follow certain people. "If you go through the followers, the Paradigm guys, not all of them but some of them, you’ll find these rival accounts that make up a lot of the percentage for people who is following. Yeah, it makes them look like they’re a big deal, it makes them look like they’ve got lots of fans, and it makes them look important." These are some really inflammatory words coming from a guy that doesn’t know sh*t. It didn’t take long for McGregor or his management team at Paradigm Sports Management to notice Barnatt’s comments, and they were none too pleased. Paradigm works with several high profile UFC fighters including McGregor, UFC middleweight Michael Bisping and Ross Pearson and hearing a fighter take their company to task over what they are calling completely false claims isn’t sitting too well with them currently. Audie Attar, the president of Paradigm Sports Management, responded on Wednesday when speaking with FOX Sports about the incident and denying the claim made by Barnatt in the first place. "When I first saw it I actually kind of laughed at it," Attar said. "Then you start connecting the dots to some other things that we found out that same day and then reading it the second time, and the third time and the fourth time and then you starting thinking wow these are some really inflammatory words coming from a guy that doesn’t know sh*t. "He’s making these baseless accusations and he’s saying he’s 100-percent certain. That’s really dangerous for a professional. The professional in me kicked and I was like who’s poisoning this young kid’s mind? Making him saying some things that could get him in trouble and be bad for him. That was the straw that broke the camel’s back." Attar says he started doing a little digging and found out that Barnatt’s representation, Denovo Elite Athlete Management, happened to be the same people that he claims tried to recently steal one of his other clients. Attar’s fighter stayed with him and maybe that’s where this angst is coming from — either way now Barnatt is caught in the middle. "I just found that his manager was trying to steal one of my clients, Conor’s teammate Cathal Pendred, and so this timing was really, really weird," Attar revealed. "I don’t know what’s going on and to be honest we’re continuing to look into things, but it’s funny that Luke’s trying to get attention through Conor’s name. Then making some defamatory claims as if they’re fact not only about Conor but about us. He’s getting into some really dangerous waters. "You and I are not attorneys but we are intelligent men and we know that when you say things for certain that can be damaging, you’re walking a fine line. So what I will do is rely upon the expertise of our attorneys and it’s a conversation we’ve already begun and will continue to have until we figure out what the best course of action will be." @audieattar my firm respects you & ur firm and will never say anything bad to gain clients.I appreciate the competition. Let the game begin! 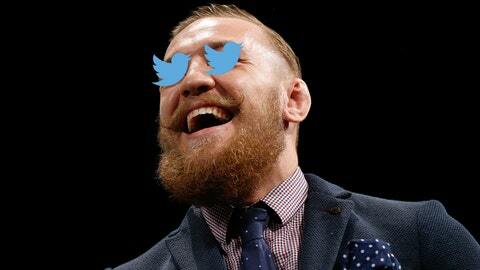 As far as the accusations about McGregor’s Twitter followers, Attar is happy to disprove Barnatt, his management team or anybody else who believes the Irish fighter isn’t gaining fans everyday by just being himself. "There’s technology where you can disprove that. He’s going to get every opportunity to show, if he’s a truth teller, he’ll get every opportunity to show because we’re definitely going to hold them accountable," Attar stated. 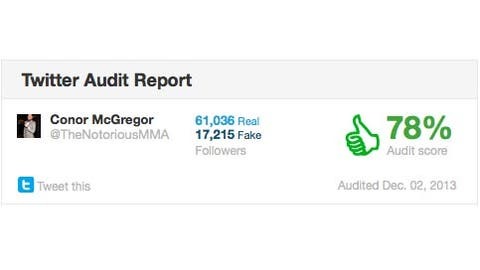 According to Twitteraudit.com, McGregor’s fan base is legit. His follower count is only 2% behind Barnatt’s. 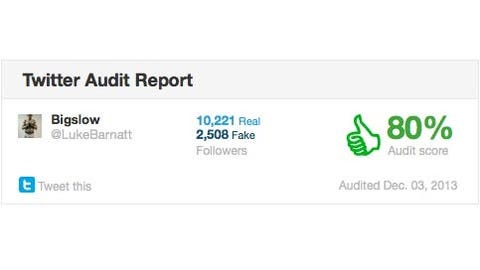 Twitteraudit.com shows Luke Barnatt’s twitter account has a nearly identical real-to-fake percantage as McGregor’s. "Conor is doing his thing, he has a nation behind him. Nothing is fake, nothing about him is manufactured." Attar doesn’t hold ill will toward Barnatt personally, but believes at the very least an apology is in order. He’s not ruling out some kind of legal action after the statements were made, but for now he believes Barnatt owes that much right now. "We’ll have to look into options and then go from there," Attar said. "The first thing he should do if he was a real man is he should apologize because he knows he was talking out of his a** or using some third party opinion as fact and that’s dangerous."